Water damage can happen any time and, in many cases, it’s more than a leaky roof. Home water damage can be caused by a variety of reasons, including cracks in the foundation, leaky basement windows, and sewage backup. Whatever the reason, these problems need to be resolved quickly. Standing water in your home can make the problem much worse and can pose serious health risks to residents. If you want to know the dangers of stagnant water, and how to get rid of standing water in your home, here’s what you need to know. 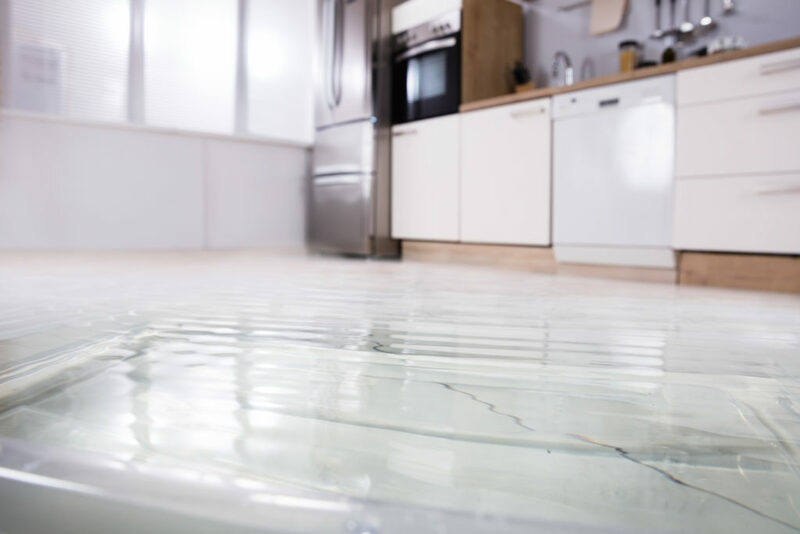 Stagnant water damage is when water that has seeped into your home remains in a single place for a long time, such as the basement, flooring, or under carpeting. Stagnant, or standing water, can come from clean sources such as a leaky sink or rainwater, or a contaminated source such as the sewer or washing machine. Standing water can become very dangerous to your health. Even clean water sources can be a breeding ground for mould. In as little as two days, standing water can sprout mould that spreads through your home. Contaminated sources of water often contain parasites, mould, harmful bacteria, and even chemicals. Bacteria thrive in moist environments and if the standing water in your home comes from water that has been in contact with human or animal waste, there will be lots of repugnant bacteria in your home. The longer water stands in your home without being removed, the higher the risk that you and your household could get sick. Shallow pools of standing water outdoors are a breeding ground for mosquitoes that could carry diseases like malaria, West Nile virus, and Zika. Indoors, standing water in crawl spaces, basements, and garages may attract rodents such as rats, mice, possums, and other vermin. They look for watering holes and you won’t want to find these rodents in your home. They are annoying and can carry diseases like rabies or spread their waste and make nests in your home. Cleaning up the water as soon as possible will eliminate the risk of vermin taking over these dark, less-disturbed areas in your home. The longer water is left standing in your home, the greater damage will occur. It can creep into the structure of your house, causing severe damage. It can rot your flooring and walls to the point where you need complete renovation. Standing water can damage the appearance of your home and repairing this damage can be incredibly costly. How to Get Rid of Standing Water? Depending on the severity of your water damage situation, you may be able to begin the cleanup and drying process on your own. Here are some common ways to remove standing water from your home and protect your property and your household. If the humidity outside your home is not too high, you can open the windows and doors to promote air circulation. Open any closet and cabinet doors, and remove drawers that may have gotten wet from the flooding or leak. More severe water damage occurrences will need assistance from the professionals and their equipment. The pros will have technology such as high-powered fans and dehumidifiers to boost air circulation and completely dry out the area. Sump pumps are submersible pumps that move water steadily out of your home through a pipe or hose. Toronto flood damage restoration companies can provide this service to you to remove higher levels of water from your home. In the case of a basement flood, for example, this tool is vital to quickly removing water from your property to begin the drying, cleaning, and restoring processes. One of the fastest ways to salvage your items in the event of a flood is to remove untouched items from the area. If the flood is caused by clean water, you can do this on your own, but if there is any chance that contaminated water has entered your home, it is best to avoid the damaged room and call the professionals immediately. Professional water damage restoration in Toronto is your best option to efficiently and thoroughly inspect your home of standing water and get it cleaned up quickly. Although it may cost you more upfront than trying to resolve the situation on your own, the expense is worth it. Without the right tools and know-how, you may not be able to get all the water dried up from your home. Any water that has seeped into cracks or into your drywall that isn’t dried can continue to spread the problem throughout your home. If you need help with basement flood cleanup and restoration in Toronto, Flood Services Canada can help you. Our professionals can provide you with solutions, and we can help you settle with your insurance company. We deploy our quick-response teams across the GTA to help you clean up and protect your home. We provide 24/7 sewage, water damage, and food cleanup services and will use the best techniques, personnel, and equipment to ensure your home is clean, safe, and dry as soon as possible. Contact us at (416) 302-2107 to learn more about our services, or use our emergency hotline at (416) 999-3930 to get our rapid-response teams deployed to your location.